Social and emotional learning (SEL) is gaining significant traction in federal and state policy. SEL is increasingly a key consideration in federal grants. 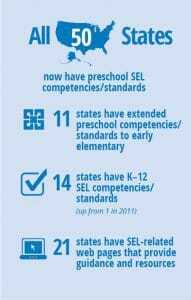 A growing number of states have developed and adopted SEL standards, goals, or competencies.